Description: 11A rolls west with 6 units up front, including a UP and a Warbonnet. 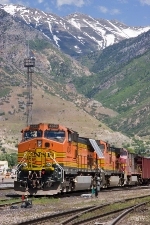 Description: Thjs UP and Warbonnet and some color to the 11A, it also had 4 black units. Description: M SCWCX1-14 with UP 5414, UP 8551, UP 8324, & SCAX 870 on the point. UP 8649 brings up the rear as the lone DPU with 61 Loads, 19 Empties, 8758 Tons, 4956 Feet. Photographed at 16:45. Description: Locomotives from right to left that I could see: BNSF 3972, BNSF 253, BNSF 1661, BNSF 502, BNSF 9413, BNSF 9443, BNSF 9416, BNSF 901, BNSF 912, BNSF 935, BNSF 870, BNSF/LTEX 1724 (SD9), BNSF 882, BNSF 885, BNSF 933, BNSF 890, BNSF 536, BNSF 926, BNSF 907, BNSF 2615, BNSF 1867, BNSF 8290, BNSF 8259, BNSF 8227, BNSF 8154, BNSF 8183, BNSF 8275, BNSF 8272, BNSF 2864, BNSF 2303, BNSF 2206, BNSF 2230, BNSF 6707 (SD40-2), BNSF 3031, BNSF 1999, BNSF 2169, BNSF 2139 and BNSF 6773 (SD40-2). Description: This old warrior has been shamefully neglected. She's waiting on Harbor tracks at the state line. Description: BNSF 870, tired and faded idling as double pusher for a short set of empty Herzog MOW open hoppers. *Note: 870 is a guess - even enhancing other images, unable to accurately read the numbers.